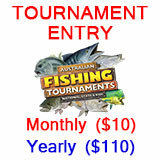 Win big in Get Fishing’s Monthly Australian Fishing Tournaments. Compete anywhere, anytime in our National, State and Kids monthly fishing competitions for a share in over $180,000 in cash and prizes annually. Over $200,000 in prizes have already been awarded to our members! 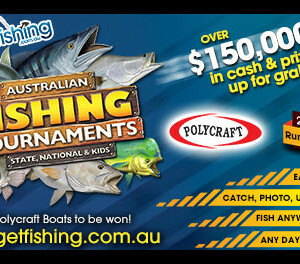 Join now and start competing today in our monthly tournaments from your favourite fishing locations anywhere in Australia, anytime of the day – compete when it suits you! There’s typically 15 species to target each month with prizes from the biggest brands in the country. Prizes are awarded for the longest fish caught in each species category. You may join and start competing at any time during the month. Monthly membership is for 1 monthly tournament or part thereof, Yearly membership is for 12 monthly tournaments or part thereof. Step 1. Become a Tournament Member by completing the Compete Now page. Step 2. Get your monthly code from the Tournament Codes page. Step 4. Upload your photos via the Submit Catch page. Familiarise yourself with the Tournament Rules before competing. If you have any questions visit our FAQ Page or if that doesn’t help get in touch via our Contact Us page. Tournament Membership: Compete in our National and State fishing tournaments. Monthly memberships will continue month-to-month until terminated. If you decide it’s not for you – no problem. No Commitment. Cancel online at any time. Alternatively pay once off and grab 12 months membership upfront. The ‘1free‘ coupon is for Monthly memberships only and valid for 1 use per member. Enter the code at checkout and your first month is FREE. If you decide it’s not for you simply cancel your membership via the MY ACCOUNT page within 1 month and you will not be charged. NOTE: Kids under 18 years of age must have parent approval and supervision when using the website or when competing in our tournaments. You must be 18 years of age or older to purchase any product or membership, or otherwise accompanied by an adult when doing so. If you are under the age of 18 you must get your parents to help you purchase membership.